Maneesh offers a unique insight into the world of yoga. Born into a traditional Indian family living in Canada, Maneesh grew up firmly established in the roots and philosophy of Yoga. In addition, a degree in pharmacology gave him an insight into the human body from a scientific standpoint.These experiences have laid a strong foundation for his yoga-asana practice and his approach to sharing asana and other yoga techniques. Maneesh’s yoga, Ayurveda, and Sanskrit studies in India further inspired his devotion to the path. He has also been profoundly influenced by world-renowned teachers Chuck Miller, Maty Ezraty, and Chad Hamrin and in addition to studying closely with them, he hosts their teacher trainings, workshops, and retreats across Japan. 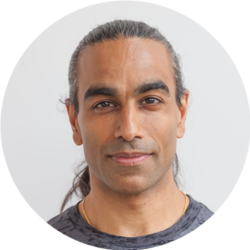 Through his years of work in the corporate world, Maneesh naturally relates to the typical yoga student who is busy with life in this fast-paced, often superficial world yet is in search of a more permanent contentment and peace. And having lived in Japan for nearly two decades, Maneesh has developed insight into the Japanese culture which allows him to reach the hearts and minds of Japanese and non-Japanese alike. His Indian roots and knowledge of Indian spirituality and culture give his teaching an authenticity that cannot be denied. It is rare to find a teacher with a mix of cultural, educational, physical, and linguistic experiences to bring together the ancient and modern, East and West, the spiritual and the scientific. “Truth is the same always. Whoever ponders it will get the same answer. Buddha got it. Patanjali got it. Jesus got it. Mohammed got it. The answer is the same, but the method of working it out may vary this way or that.” ― Swami Satchitananda; The Yoga Sutras.